I simply love the days when I have a little time and am feeling creative in the kitchen. I love puttering around the kitchen, it's one of my favourite things to do. Especially since the result is often something delicious to enjoy with my friends and family. This week, I was doing my thing and exploring my pantry when I realized I had a bag of Arborio rice that I bought a little while ago. 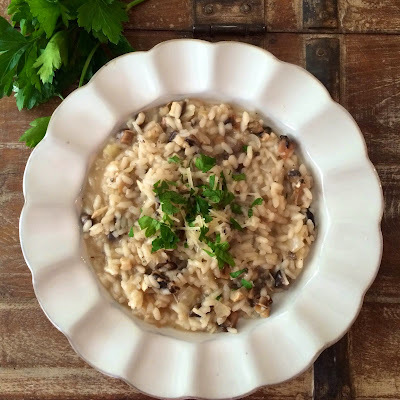 It was a rainy evening- perfect for a delicious dish of risotto. I found I had a few types of mushrooms and some parmesan so I was all set to create a comforting dish when I realized I was out of white wine and needed some to liven up the flavours. I made a substitution and came out with a recipe I will definitely repeat and hope that you try in your own kitchens. Bon Appetite! If you try this savoury risotto at home, I'd love to hear about it. Please leave me a comment below!